Super Pup 2, (SP2), continues the Dobes primary obedience; the initial taste of rules in “our home” before it gets to your home. Guided always while in the “home”, the canine student now has two to three other instructors to help in the various areas of home rules. At least one instructor is around the dog, always teaching home rules during its primary obedience instruction. All staff that work with the Dobe, from obedience instructors to home rules instructors, have the right credentials. My obedience team have seen both their own, and client Dobes make the Doberman Pinscher Club of America, Top 20 chart many times. The entire team still all enjoy working with these fresh young minds. Remember, you have to first teach the child to walk before you teach it to run - that's what the Super Pup Programs are all about. In effect, we are their family. From birth each become individuals. When the young pup is old enough to step away from its mom and give us a kiss, is the time it is given it's call name. This name, many times, is already given to us by the future family - there are no strangers here. In the home program, we set up situations just to be able to say, "that's a NO", but always looking for the moment or action where we can reward with "Good Boy", "Good Girl", by touch and voice. When the time is right we hand them a treat, but, even handing them a treat is teaching the rule of "Gentle", meaning leave the fingers. Note: Without being given freedom in the home environment, the dog cannot begin to learn the rules of in-home life. Using a kennel as a safe house during initial placement may be the right way to go when first entering their new life before they settle in, but, only guided freedom can give the pup the opportunity to continue learning the right ways from the wrong ways. These youngsters will be given guided freedom during the day by our staff in our office complex, which is where each pup began life in a home; there is always someone around to correct their misadventures. This is a great jump start in the complexities of living in residence. (Of course, you should consider the use of a safe area - a pen or type of cage when you can't be the supervisor.) We will issue instructions specifically guided by knowing the dog and the details of its new life and environment; and we set the Dobes up to err instead of waiting for mistakes. Not to miss one of their cute puppy tricks, we also have 16 cameras in the same facility. If an iPhone is grabbed, someone counter surfs, or a shoe moved even a few feet, we know who the kid was. The kids are young. Always, in the beginning, from our SP2 to our most advanced program, the more they are introduced to freedoms with guidance before placement, the easier for you and the 'kid' during the beginning days of their new life. Your new companion to be, may be a pup or an adult. Whether one or the other, it will need your guidance and understanding in the early days as you are building the relationship between each human member of the family; all the while introducing it to the rules of their new home. Plus, if other cats, dogs, birds or – well, we'll leave the OR open for now, are also in residence, we hope we had been advised early on, to familiarize the pup with those members also. It helps to know all in residence and is why we require the Client Profile up front; so we can add a few more pointers before the pup arrives. And the house, well, the fact that every door has a different use, and every room has its own specific guidelines, even our Presidents Course graduate needs a personal guide in the beginning. In effect, as an example, one of our clients, after taking his new best buddy, Chance, to the waterfront at Annapolis, experienced what the owner described as Sensory Overload! Chance seemed a bit nervous but soon was enjoying the moment and all the people that came over to say hi, but Chance was concerned. Really, we never have had a Sail Boat or Yacht move past us on Ranch Road and rarely see anything around here but party boats and fishermen on Douglas Lake. So truly unless one of our trainers will be delivering your new 'kid' and staying a week or more to introduce the Hoytt Dobe to it's actual new life style, you as the new parent still have obligations to your new kid to understand all will go so much better if help the Dobe understand the new world. So folks if you are about to introduce the Dobe to even it's first yard parties or the overnight guests or those allowed to come and go as they please just give us a call and we will talk you through the new learning experiences. Now the young male above is Jet. Seen here with his new 'dad' at Morristown, TN, airport. The two loaded up and flew to Washington DC, with minimal stress. The program that Jet was put through began around six weeks of age when he was presented to his owner after we had selected the boy and also agreed to allow the future dad to visit. Specifically selected and trained for his new family, he started training within four weeks after this introduction. 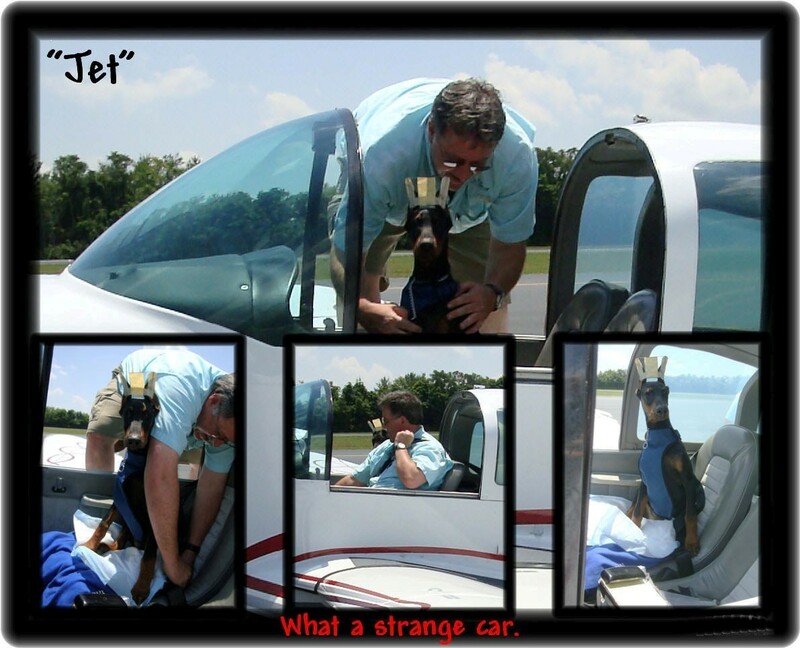 At just 17 weeks old, Jet proved both our selection process and our training team’s expertise allowed us to add optional road trips through the winding, dipping, and rough back roads to help desensitize the boy for his flight home. Jet was just as calm and happy as he looks here, also showing his confidence in the terminal. A perfect gentleman even when his new dad picked him up and put him in "the car". $3,495.00 - includes room and board with no added cost for Super Pup Level One. Do remember to add the cost of the pup with our extensive medical completion program services and health tests given before placement. For additional instruction in home rules, travel, further obedience refinements as well as off property social experiences see: Custom Young Adult Programs Level One and Level Two.